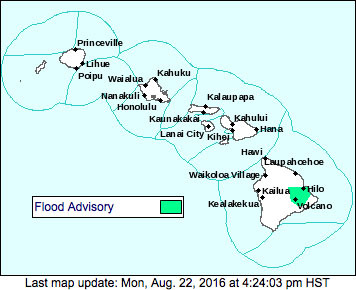 The National Weather Service in Honolulu has issued a Flood Advisory for Hawaii Island until 6:30 p.m. tonight (Aug 22). At 3:24 p.m. weather radar showed heavy rain South of Hilo near Hawaiian Paradise Park, Mountain View and Volcano. Rain was falling at a rate of 1-2 inches per hour. Locations in the advisory include, but are not limited to, Hilo, Hawaiian Paradise Park, Mountain View, Keaau, Volcano, Glenwood, Orchidlands Estates, Hawaiian Acres, Hawaii Volcanoes National Park, Ainaloa, Kurtistown and Fern Acres. This may be extended should heavy rains continue.